on the main dance floor (upper level) at the Pyramid Club! MEMENTO MORI DJs Valefar, Stalagmike, Ana Vice, and special guest DJ Parma (Coven, U.K.) spinning a variety of outstanding classics, obscurities and new developments all night! $6 cover after 9PM. 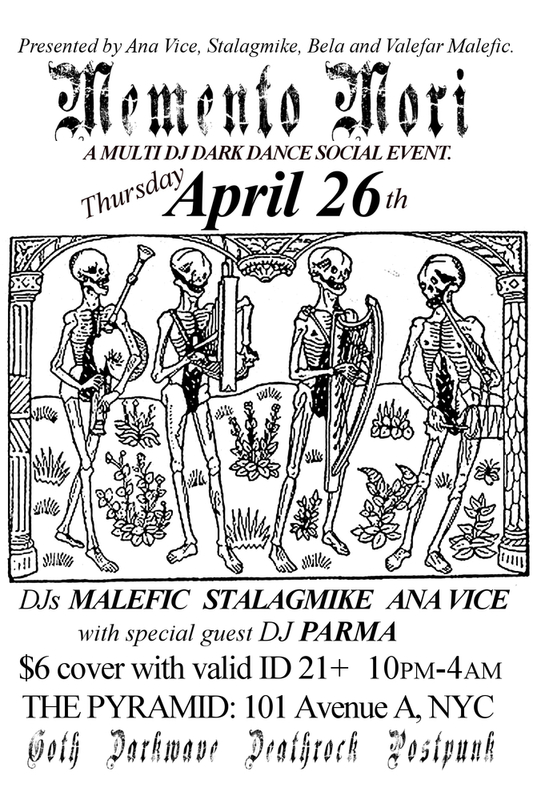 MEMENTO MORI starts at 10PM. 21+ and please bring valid ID. Presented by Ana Vice, Stalagmike, Valefar Malefic, and Bela. For MEMENTO MORI we suggest the following dress code: Goth, Vampire, Witch, Ghoul, Sinister Dandy, Dark Glam, Edwardian, Victorian, Deathrock, or basic black. Invite design by Ana Vice 2018.